In this article, we review the options of translating websites and sum up the pros, cons and costs involved for each option. 1. Translation directly in the customer’s Content Management System (CMS): translators do the translation right in the customer CMS’s admin interface. 2. Using content connectors: the customer’s IT department extracts the source content for the LSP, and then they put back the translation into the original CMS. 3. 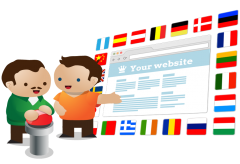 Using Translation Proxy: whenever a foreign visitor visits the website, the translation happens real-time, based on the previously uploaded Translation Memory. Only a few CMSs are prepared to provide multilingual content. And even if they do, it is usually just a simple text box for every component where the translator – after logging in – can type the translation in, without seeing the context. The CMS can not provide the necessary translation features (Translation Memory, terminology, consistency of the translation, automatic translation of the repetitions). As a result, extra time and efforts are needed, may end up with inconsistencies and poor translation quality. The customer’s IT department extracts the source segments from the CMS and delivers it to the LSP in files. The LSP processes the file in their own environment, using their own CAT tool and TM. When the translation is done, the customer’s IT department gets the translated files and integrates it back to the CMS. The customer uses a real-time translation layer (called Translation Proxy) on the top of the original website. Whenever a foreign visitor comes to the website, the traffic goes through the Translation Proxy. The Translation Proxy fetches the original content from the server, in the source language, as it is at the moment, then translates all the segments on-the-fly according to the uploaded Translation Memory, where the LSP has done the appropriate translation previously. When the Translation Proxy has translated all the segments on the page, it will be shown to the foreign visitor. Beyond these 3 approaches listed above some mixed solutions also can be used, e.g., content connector with Translation Proxy to do in-context translation. In the next blog post we will drill down into the Translation Proxy approach in details.